Why do we store gas? providing support for wind energy by enabling delivery of electricity being produced on the basis of natural gas during periods when the wind is not blowing with the adequate force. The history of underground natural gas storage in Poland started in 1954 in partially depleted gas deposit Roztoki located near Jasło. 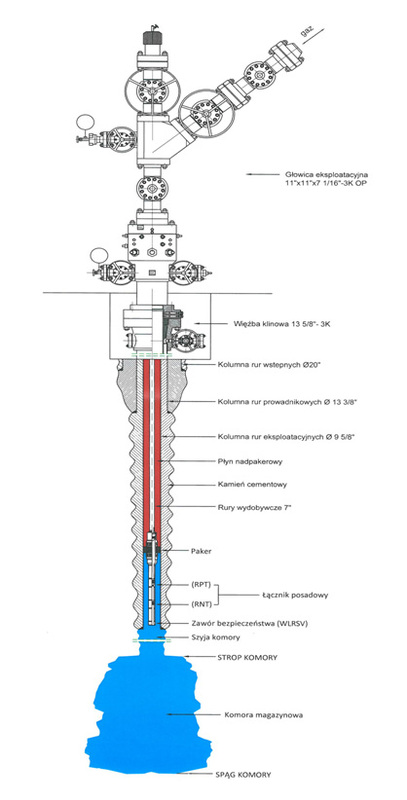 UGS Roztoki was the first underground gas storage facility in Poland and one of the first in Europe. The rapid development of UGS in Poland started in 1979. That was the time when operation of UGS Brzeźnica and UGS Swarzów was initiated. Subsequently, the operation process included the following facilities: UGS Strachocina, UGS Husów UGS Wierzchowice, CUGS Mogilno and CUGS Kosakowo. The years when individual underground gas storage facilities in Poland were being included in the operation are shown below. UGS Roztoki was located in what currently is the Podkarpackie voivodeship in the Jasło region. Geographically, the area is located in the valley of the Jasiółka river within the area of Jasielsko-Krośnieńska Valey, being a part of Pogórze Środkowobeskidzkie. 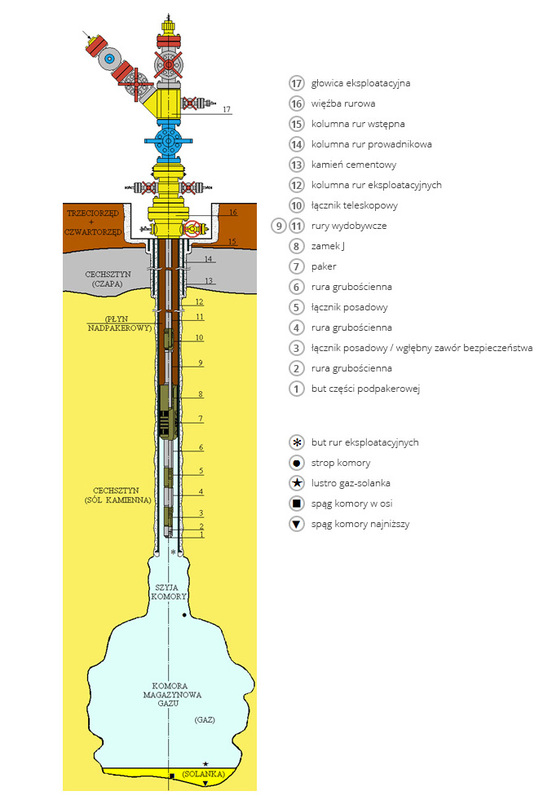 The deposit of high-methane natural gas and crude oil Roztoki-Sądkowa was discovered in 1922. The original recoverable reserves were documented in the volume of 692 million cubic meters of gas. The operation of the deposit began in 1931 and lasted continuously until 1954. Then due to the decision to build the UGS facility, the gas production was stopped and the process of gas storage began. The degree of exhaustion of the primary recoverable reserves in 1954 amounted to approximately 92%. The oil and gas deposit at the Roztoki – Sądkowa block, which was used for storage, developed within the Potok fold in the formations of the Silesian nappe. The bed level is the second horizon of Eocene Ciezkowice Sandstone. There is a zone of gas and oil in the bed. They are supported from the floor by not very active reservoir water of surrounding and underlying character. Storage level is insulated from the top and bottom by the layers of Hieroglyphic and variegated shales. There are many ways of storing natural gas but the most popular one uses underground storage facilities. The majority of UGS facilities are located in partly depleted oil and gas reservoirs. Usually there are existing connections with major gas pipelines. Wells and surface facilities already existing in the field can be utilised, which significantly reduces the construction cost. Reservoir geology is well recognised. A reservoir forms a geologic trap, which minimises the risk of uncontrolled gas leakage from the storage. Unproduced indigenous gas may be used as a gas cushion, which reduces the investment expenditures. Usually facilities of this type are capable of running only one injection/withdrawal cycle during a year. The wells and overground infrastructure of such fields is usually relatively aged and requires costly reconstruction and maintenance. The first storage facility of this type was built in 1916 in the State of New York in the USA. 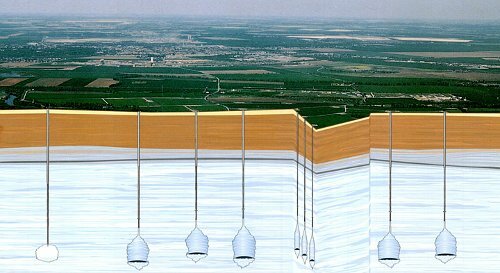 There are many underground gas storage facilities located in aquifers. Such structures may be used for underground gas storage when the aquifer stratum is covered by impermeable rock stratum and forms a trap. 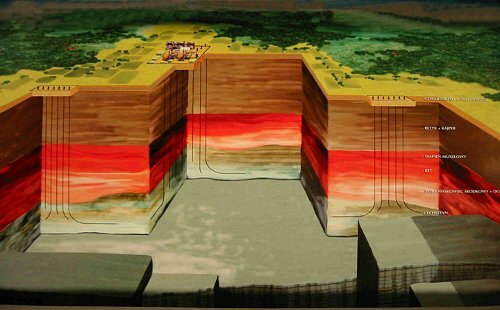 The geology of aquifers is similar to that of partly depleted hydrocarbon reservoirs but the construction of underground gas storage normally requires a larger gas cushion to be formed and more detailed monitoring of the gas injection and withdrawal process. Also, no existing technical infrastructure, such as wells, pipelines, dehydrating installations, compressors, etc. is available in this case. Comparing to installations in depleted reservoirs, UGS facilities in aquifers may require more powerful compressors and more efficient dehydrating equipment. On the other hand, owing to the presence of water, the pressure in such facility is higher which results in the possibility to achieve higher gas withdrawal rates. This is particularly important in case of a sudden need to deliver large volumes of gas to the grid. Usually located in close proximity to final consumers. Better capability of running multiple cycles in one season as compared to storage in depleted reservoirs. High geological risk. A structure of this kind did not contain hydrocarbons in the past, which means that there is some uncertainty as to the tightness of such facility. Higher operating costs related to extraction of water. Need to create a large gas cushion. Storage in aquifers was used for the first time in 1946 in Kentucky (USA). The majority of storage facilities of this kind are operated in the United States, France and the territories of the former Soviet Union. Storage facilities located in salt caverns are characterised by very high injection and withdrawal rates in relation of the working volume. They occupy much smaller space than other types of storage. This results in much easier facility monitoring and operation. Also, the construction time is shorter. 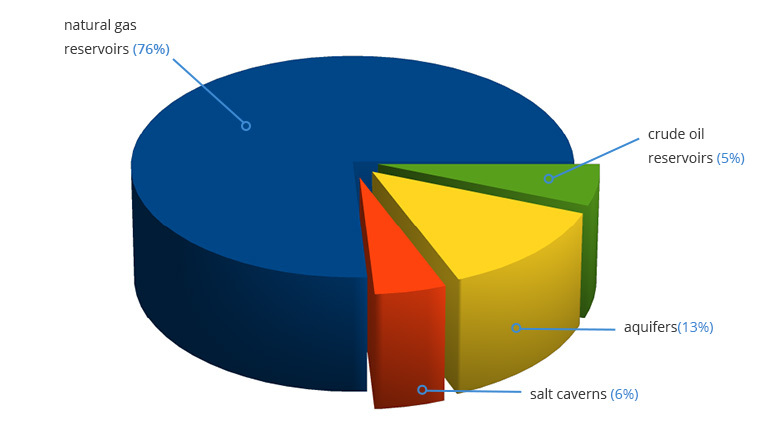 The development of salt caverns, calculated in relation to the achieved working volume, is however more costly than in case of depleted hydrocarbon reservoirs or aquifers. On the other hand, the facilities of this kind may run multiple injection and withdrawal cycles during one year, which greatly reduces the cost per unit of gas stored. Despite the fact that this type of storage is most expensive as regards both the construction and maintenance, it provides a very good security in case of a sudden growth of demand for natural gas. It is also more useful in regulating short-term fluctuations, both on national and local scale. Small share of buffer gas in the total storage volume. 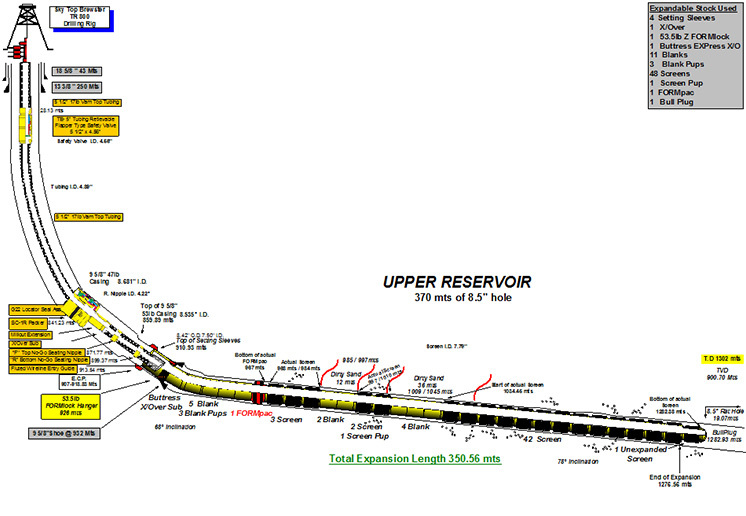 Very high injection and withdrawal rate (much higher than in case of storage in depleted reservoirs and aquifers). Capability of running multiple injection and withdrawal cycles during one year, which enables the balancing of smaller fluctuations of natural gas supply and demand (e.g. daily). High investment expenditure required for construction of such storage facilities. Limited options for utilisation or disposal of brine produced during cavern leaching. Loss of working volume as a result of convergence. This type of storage facility was used for the first time in 1961 in Michigan, USA. import of natural gas - about 70% (Russia is the main supplier). Sources of domestic natural gas supplies have a delimited capacity resulting from geological and deposit conditions, the number of wells and operating parameters. Deliveries of imported gas are usually at the stable level resulting from the execution of agreements and technical parameters of transmission network. As regards imported gas supplies there are also some periodic risks due to political reasons. Moreover, in our climate there are significant air temperature differences between the summer and winter seasons, which causes periodic fluctuations in the demand for natural gas for heating purposes. Due to the ability to maintain mandatory and trade reserves of natural gas, Underground Gas Storage facilities play a crucial role in ensuring the energy security of the country. They also increase the energy independence of our country in the periods of peak demand for natural gas. The injection of gas to the storage facility takes place as follows: gas from transmission pipeline (9) flows through strainers (8) which capture any solid or liquid impurities, and then passes to the custody transfer section (7). After the measurements are taken, the natural gas stream flows to the gas compressor station (5). After compression, the gas is transported to coolers (6) in order to be cooled down. After the cooling, the gas is sent to the gas distribution station (3). From the distribution station the gas flows to individual wells (2) through which it is injected to the storage reservoir or the cavern (1). During the withdrawal gas from individual wells (2) is fed to the gas distribution station (3), and then to the gas dehydration installation (4). After the dehydration, the gas stream flows to the gas compressor station (5). Following the compression, the gas is passed through gas coolers (6) to the custody transfer section (7). Once the measurements are taken, the gas is delivered to the transmission pipeline (9). The injection of gas to the storage facility takes place as follows: gas from transmission pipeline (9) flows through strainers (8) which capture any solid or liquid impurities, and then passes to the custody transfer section (7). Once the necessary measurements are taken, natural gas flows to the gas distribution station (3) and then it flows to individual wells (2) through which it is inject to the storage reservoir or a cavern (1). During the withdrawal gas from individual wells (2) is fed to the gas distribution station (3), and then to the gas dehydration installation (4). From this point, the gas is sent to the custody transfer section (7). Once the measurements are taken, the gas is delivered to the transmission pipeline (9). Core - a cylinder-shaped piece of rock obtained as a result of drilling through rock formation by the means of a coring bit. 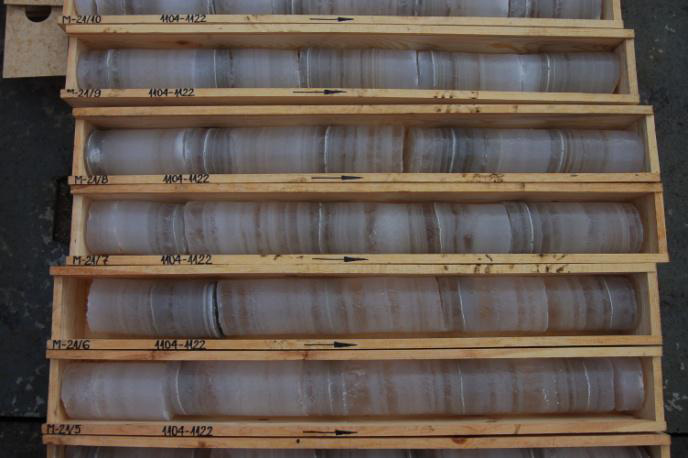 Cores are taken from boreholes during engineering geology studies with a view to understanding the geology of the area. They enable, among other things, accurate determination of the rock types and dip. 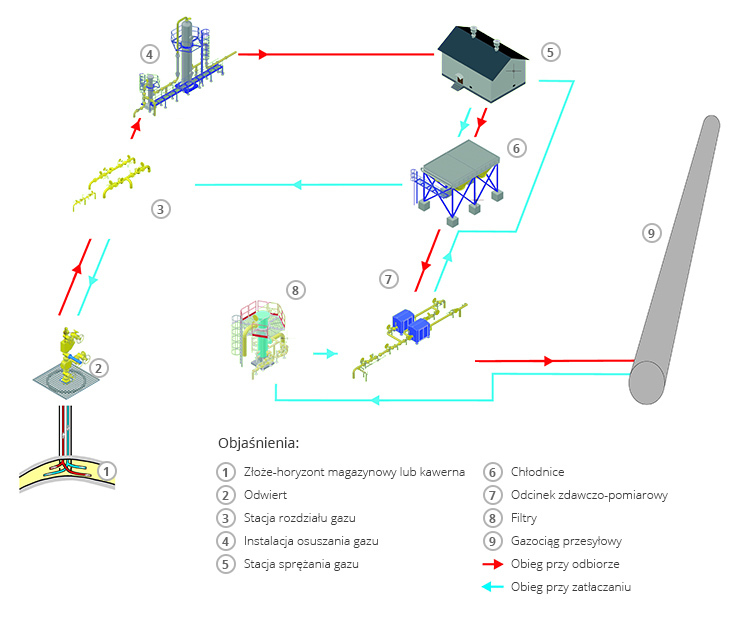 The territory of Poland offers suitable geological and mining conditions for the design and construction of large-scale underground hydrocarbon storage facilities in halite deposits. Halites are found within two saline formations, i.e. Upper Permian (Zechstein) and Neogene (Miocene). 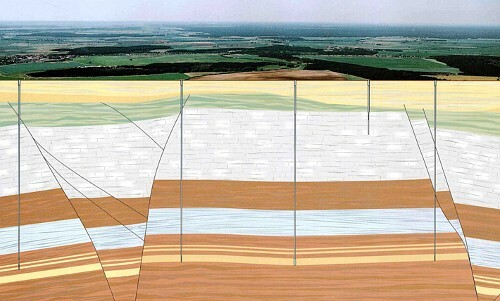 Due to their extent and geological and tectonic considerations, the most favourable conditions for the development of underground gas storage facilities exist within the Zechstein saline formation. In this formation, halites are present in diapir or stratiform-type deposits. In Poland, eleven diapir deposits (Wapno, Damasławek, Góra, Mogilno I, Moglino II, Lubień, Łanięta, Kłodawa Północ, Kłodawa Centrum, Kłodawa Południe, Rogóźno) and six stratiform deposits (Łeba, Mechelinki, Zatoka Pucka, Kazimierzów – Sieroszowice, Rybnik – Żory – Orzesze, Bytom Odrzański) have been discovered. Due to their geometry, diapir rock salt deposits have a limited horizontal extent (up to several kilometres) and very significant vertical penetration (up to several thousand metres). Because of their geological history diapir deposits typically have a complex internal structure. Stratiform salt deposits have a vast horizontal extent but a limited thickness. The structure of stratiform halite deposits is relatively simple as the beds run horizontally or are slightly inclined and moderately disturbed. The bed thickness varies within the range from 200 to 300 metres.